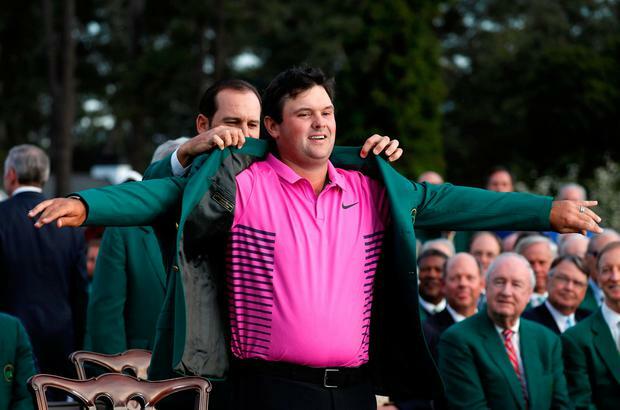 As well as picking up a handsome winner's cheque of €1.61m, Masters champion Patrick Reed has a lot of perks coming his way after coming out on top at Augusta National yesterday. Reed held off strong Sunday challenges from Rickie Fowler and Jordan Spieth to win his first Major championship, and while it is always a great day for a golfer when they win one of the four marquee events, the Masters gives some special benefits to the victor. Firstly, Reed will receive one of the iconic green jackets worn by members of Augusta National. 2017 champion Sergio Garcia presented Reed with one last night during the trophy presentation, but the 27-year-old will now be custom-fitted for a jacket of his own. Reed can take the green jacket home with him and is allowed keep it for one year, after which it must be returned to the club. A winner still 'owns' the jacket and whenever they visit Augusta in the future they are allowed to wear it. He will also be invited to host the Champions Dinner next year, held the week of The Masters, and can attend the annual meal every year thereafter. Every living Masters champion is invited and the menu is set by whoever won the last tournament. This year, Garcia chose an international salad to start, traditional Spanish lobster rice for main course and tres leches ice cream and espuma for desert. Winning the Masters also gives you access to the exclusive Champions locker room, which is reserved for previous winners away from the rest of the participants. Every new champion is given a locker to share with a legend of the game - recent winner Jordan Spieth was paired with four-time winner Arnold Palmer, before the legendary golfer passed away. Another perk that champions can enjoy is playing the course outside of Masters week. Augusta National is probably the world's most exclusive golf club and even the world's top players can't just show up and play a round. But champions have special privileges and both Adam Scott and Jordan Spieth have played 18 holes with their dads on the hallowed course after being named honorary members upon winning the tournament. Reed has also gained a lifetime exemption for the tournament, so he no longer has to worry about being inside the top 50 in the world to qualify. And lastly, there are plenty of monetary benefits to winning the Masters outside of picking up a giant winner's cheque. Reed would have qualified anyway, but the 100 rankings points he claimed yesterday means he will compete in the four World Golf Championships, which do not have a cut after the first two rounds, so a cash finish is guaranteed. The Masters is also worth 600 FedEx Cup points to Reed, which gives him a leg up in the extremely lucrative end-of-season competition. And finally, Reed has also qualified for the 2019 Tournament of Champions, an event where all the players who won on the previous year's PGA Tour compete. Again, there is no cut so Reed can buttress his bank balance further. Winning the Masters was the best day of Reed's career, and he will be reaping the benefits for the rest of his life.